The mission and goal of the town is to provide a semi-rural living environment for the residents and provide necessary services while maintaining a low and affordable tax rate. The town continues to accomplish this goal through proper land use planning containing the appropriate mix of residential, business, agriculture and open space. The Town Board believes strongly in the need for cooperative intergovernmental efforts. The Town of Waukesha is located in south-central Waukesha County, on the outer perimeter of the City of Waukesha, approximately 50 minutes east of Madison and 20 minutes west of Milwaukee, Wisconsin. Since 1958, the town hall offices and fire station have been located on a 10-acre parcel at W250S3567 Center Road, just south of Sunset Drive and north of STH 59. 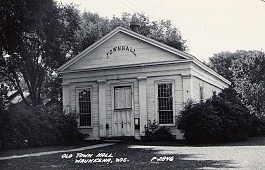 The Town of Waukesha, originally named the Town of Prairieville and located in Milwaukee County, has been in existence since 1842 with the original Town Hall located at East and Wisconsin Avenues in what is now downtown Waukesha. As of the 2010 census, the Town of Waukesha has a population of 9133 with 3382 residences. The town offices which are handicapped accessible, are staffed with a Clerk/Treasurer and Deputy Clerk/Treasurers. The town has a Public Works Department with two full-time employees and one part-time employee. The Fire Department also providing rescue service has a full-time Fire Chief, a Firefighter/EMT/Fire Inspector and around 40 paid-on-call personnel. The entire Town of Waukesha is within the Waukesha School District.